It’s not that often that the paparazzi turn out in great numbers for an event in aid of a salon-sized highbrow institution. But Wednesday 22nd March saw a heartwarming affirmation of support for one of London’s cultural stalwarts, the Institute of Contemporary Arts (ICA). And, if the mixture of those going done the red carpet was anything to go by, it’s good to see that the ICA still appeals to a very broad cultural audience indeed. 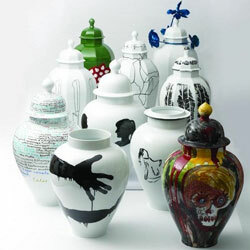 The charity gala – the three courses donated by some of the UK’s most renowned chefs- segued neatly into the charity auction, the mission of which was to sell off ten special pairs of Thomas Goode covered vases reworked by a star-studded group of artisits: Sir Peter Blake, Antony Gormley, Michael Craig-Martin, Marc Quinn, Shezad Dawood, Keith Tyson, Gavin Turk, Julian Opie, Tracey Emin and Jake and Dinos Chapman; in running order of the auction. The auction itself was run by Simon de Pury, Chairman of Phillips de Pury & Company. 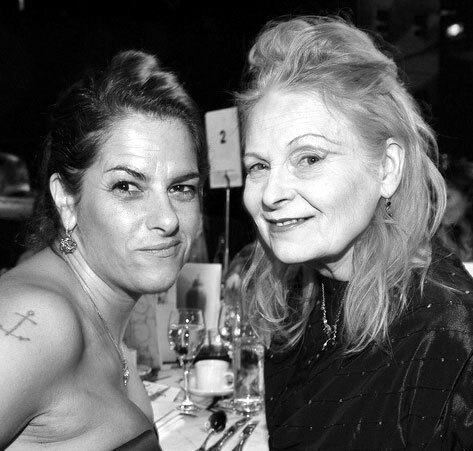 Highlight of the run-up to the big sale was the perfect double-act of Vivienne Westwood and Tracey Emin exhorting us to pay well in aid of a good cause. Vivienne – whose own tablecloth designs for the event were up for auction and were the perfect accompaniment to the Victorian theatre camp of Kokos where the event was held- appealled to our higher cultural sensibilities. Tracey, true to form, simply suggested that we buy her jugs. But, if anyone was expecting that it was all about them treating the ICA well, then the tables were truly turned when it came to the entertainment. Lulu strutted her stuff and proved that her voice still has it where it needs it. But even the most staid of collectors and patrons could not hide their excitement at the headliner: Mister Bryan Ferry esq. By the time the tables had all been rolled away and the young guns who had opted for the more affordable after party had arrived, it’s reasonable to say that when Bryan Ferry walked onto stage – with his bevy of beautiful backing singers and musicians in tow, of course- the sense of youthful excitement was as tangible as it must have been all those years ago when Roxy Music ruled supreme. The hip kids and the tuxedo-wearing patrons from the world of high-finance were instantly united. And they were not disappointed. Known for his own interest in all forms of art, Bryan gave us his best that, quite frankly, was ageless. Suave, slick and still with the same amazing voice, his set that included many of the Roxy Music greats, pleased at least five generations of fans. And, thanks to Mister Ferry’s brilliant performance, the feel-good factor gave the subsequent line-up of djs – a number of whom were drawn from some of the UK’s hottest bands and music scenes- a great introduction for keeping the dancefloor heaving until the small hours.